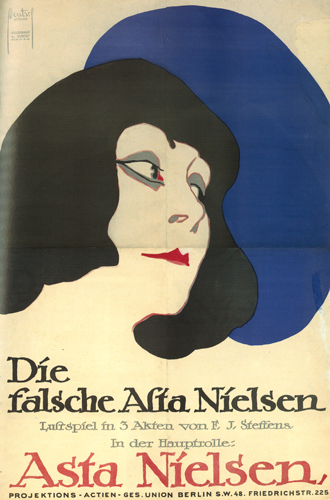 Double trouble: Die falsche Asta Nielsen | The False Asta Nielsen (DE 1915) | Silents, Please! Poster from the collection of the Staatliche Museen zu Berlin; reproduced in the book Nachtfalter. Asta Nielsen, ihre Filme. 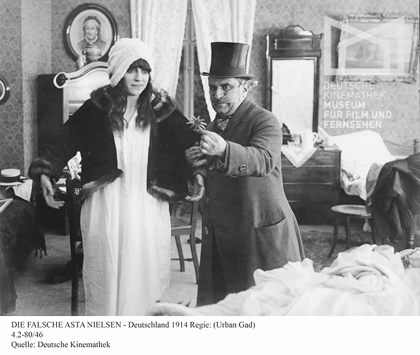 Die falsche Asta Nielsen is a film that, barring a miracle, I will never see: no copies are known to exist. It’s a great shame, because it looks like a lot of fun! Asta in a double role, a comedy of identity, some great scenes of dancing, wonderful costuming. This film piqued my interest some time ago, so when this blogathon with the theme of double divas came up, I thought it would be a good opportunity to write about it. So what can I say about a film a century old, that probably no one living today has seen? Firstly, the context. 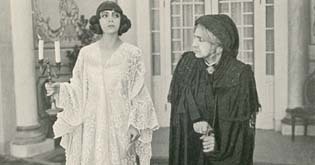 Die falsche Asta Nielsen was filmed in 1914 and released in 1915, a period when Asta Nielsen was at the height of her fame: a major European star, the movie star to many people. She became internationally famous before the star system in the USA really kicked off, but paradoxically failed to break the American market. (Why? The answer isn’t clear-cut, but a number of factors in the US context can be identified: structural factors in the distribution field; a move to longer feature films, and the promotion of serials; a general shift towards Americanization and emphasis on the homegrown product; misleading marketing and the difficulty of establishing a coherent star persona for Asta in the US; the advent of World War I). Anyhow, it’s well-known that I am a huge fan of Ms. Nielsen, often known simply as Die Asta – previously I’ve written about her films Das Liebes-ABC | The ABC of Love (DE 1916) and Hamlet (DE 1921). Nielsen was an accomplished actress who played a wide range of roles, and her vivacity and charisma is outstanding even today; a true generational talent. 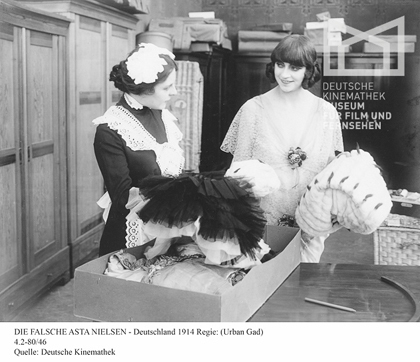 The film itself may be lost, but luckily, quite a few materials relating to Die falsche Asta Nielsen have survived. The book Nachtfalter. Asta Nielsen: ihre Filme reprints excerpts of a Viennese programme that describes the plot in detail, and I’ll relay it here (to the best of my ability, given my dodgy knowledge of German), with the aid of surviving production stills. 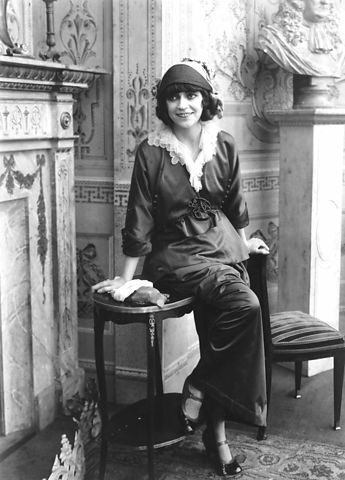 Asta played two roles: Bolette Baumbach, the barber’s daughter; and a representation of herself, the star Asta Nielsen. 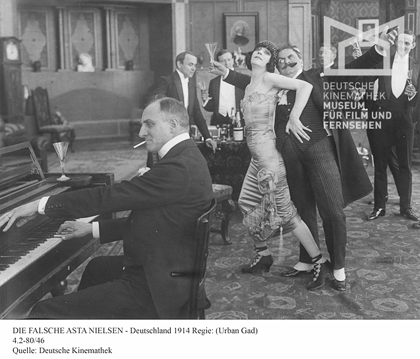 Bolette is a fan of Asta Nielsen and aspires to her success and lifestyle; with her father, she goes to see Das Feuer | The Fire (DE 1914; pictured in above still), for which their enthusiasm knows no bounds. Looking at his daughter, Herr Baumbach has a thought: his daughter has the face of a second Asta, and with the help of the theatre hairdressers to upgrade her ‘do, the two would be indistinguishable. One only needs business capital (Betriebskapital). To that end, he writes to Asta Nielsen in Copenhagen (in fact, not her residence at this time in her career): a poor young actress wants to devote herself to the film art, and could Asta please donate to her some of her fashionable garments that she no longer has need of? Asta acquiesces, but in the haste of packing, a valuable piece of jewellery is accidentally sent along with the dresses. Herr Baumbach receives the jewellery with happiness and deposits it at a jeweller. Now armed with money and the requisite clothing, he takes his daughter to the finest hotel in Waldenburg, and organizes for her to perform there. The setup is quite plausible as Asta Nielsen is contracted to do a guest performance there, and with her father as impresario, the untrained Bolette-as-Asta takes the stage. As the stills indicate, hi-jinks ensue! But she gains an admirer and is invited to film the next day. 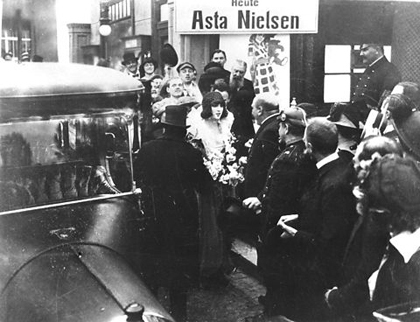 Not long after, the real Asta Nielsen arrives in town and is confused at the strange reaction she receives. 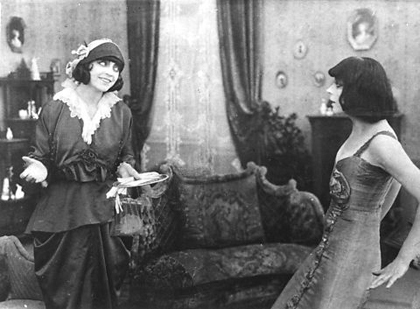 She finds out about her doppelgänger; now Asta Nielsen wants to film with “Asta Nielsen”. At the studio, Bolette stares dumbfounded and amazed at her double (her father has quietly slipped off). Revenge? Asta Nielsen is “too much a woman of the world” to bother with that; the reactions of fear and awe are punishment enough. No word on the jewellery! Presumably Asta recovers it, as no diva worth her salt can be without her diamonds. 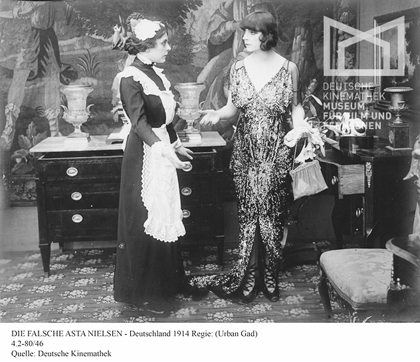 In the Netherlands, Die falsche Asta Nielsen is also known to have screened in Den Haag, Groningen, Rotterdam, and Utrecht. Here’s an advert from the Rotterdamsch Nieuwsblad of 17 February 1916 for a showing at the Thalia Theater, operated by Abraham Icek Tuschinski, for whom was also built the famous, beautiful Theater Tuschinski in Amsterdam. I also found a mention of the film in an article in Kinema journal in 1916, which discusses Das falsche Asta Nielsen in relation to the theatre. 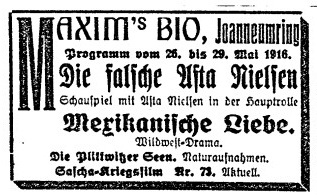 And an interesting oddity: the German Early Cinema Database reproduces an article called Die falsche Asta Nielsen, appearing in the Berliner Börsencourier on 23 August 1913. The article recounts the antics of a pair of swindlers who had been targeting hotels and pensions, the woman posing as Asta Nielsen. In fact, she was a waitress named Friederike Nielsen, who the article notes made every effort to mimic the famous film actress. With her hairstyling efforts, the trickster bore some resemblence to Die Asta, and had apparently mimed the role of the movie actress with success for some time. At the time of the article she was serving a two-month sentence for her fraud against the hoteliers and pension-owners. Art imitating life? As for the film Die falsche Asta Nielsen, we can only dream that one day it turns up. It’s one I would truly love to see. This post is my contribution to the Fourth Annual Dueling Divas Blogathon. Many thanks to Lara at Backlots for organizing and hosting this event; see all the other entries here. Die Falsche Asta Nielsen. Dir. Urban Gad. Berlin, Germany: PAGU (Projektions-AG Union), 1915. Lost film. Images are from the Deutsche Kinemathek (watermarked) and the Danske Filminstitut (unwatermarked). More stills can be found on the European Film Gateway. This entry was posted in Film and tagged Asta Nielsen, blogathon, cinema of 1915, cinema of Germany, dual roles, excellent women, film about film, lost films, original research, Urban Gad. Bookmark the permalink. Really it’s too cruel for you to taunt us with such an amazing-looking ‘lost’ movie ;) But I love how the stills you posted convey so much emotion, and the idea of Asta Nielsen playing herself is wonderful. Interesting how even the cult of ‘celebrity’ pervaded silents. Fingers crossed Die falsche Asta Nielsen is lurking in a basement somewhere in Germany! It really does look great, doesn’t it? If it turns up someday, I would be overjoyed. Such an interesting post and actress. And I agree with Girls Do Film – mean tp make me want to see a lost film! Seriously – great entry in the blogathon and so nice to learn about your blog. Great work. What a clever idea for a film – a star playing herself in two roles. Fabulous! I admit I’ve never heard of Asta Neilsen before. She was so beautiful – and great hair, too! I’m off to to some online researching on Die Asta. Great choice for the blogathon! I’m happy to have introduced her to you! Yes, it’s very self-reflexive, and must be one of the earlier films to comment on movie stardom so directly. The only other one I can think of from the early teens is Max Linder’s Les débuts de Max au cinéma (1910). Oh my. This must be a wonderful film. I’ve seen some of Asta Nielsen’s work from the early 1910s, and now I wish this film can be found. Let’s dig some attics searching for it! You have a marvelou blog… and a new follower! Thanks for the knd comment! Asta is wonderful, I wish she was more well-known among silent film fans.